I know, I know… savory and salad in the same sentence just doesn’t make sense. HOWEVER, if you have tried any or all (you can accomplish anything if you believe in yourself) of the salads at the restaurants listed below, you understand that these salads have the ability to be just as tasty as any other dish. ESPECIALLY if you trust the expertise that lies within the restaurants I am sharing with you today! The last time I visited Woodfire Brick Oven Pizza I had the pleasure of trying two salads. I ordered the Arugula Salad for myself, which contains arugula (#OBVI), dried cherries, walnuts, goat cheese (I hated goat cheese for the longest time until I finally realized that I have been doing everything wrong in life), and grape jam vinaigrette. This salad is the reason why the phrase “simplicity is key” exists. Yes, some salads are delicious because they have so many different ingredients incorporated into them, but this salad is mouth-watering with as little as FOUR ingredients (plus dressing). After the Arugula Salad, I tried a bite (or three or five – I’m telling you self-control is not my strong suit nowadays) of my mom’s Woodfire Wedge Salad. My world has been rocked people. 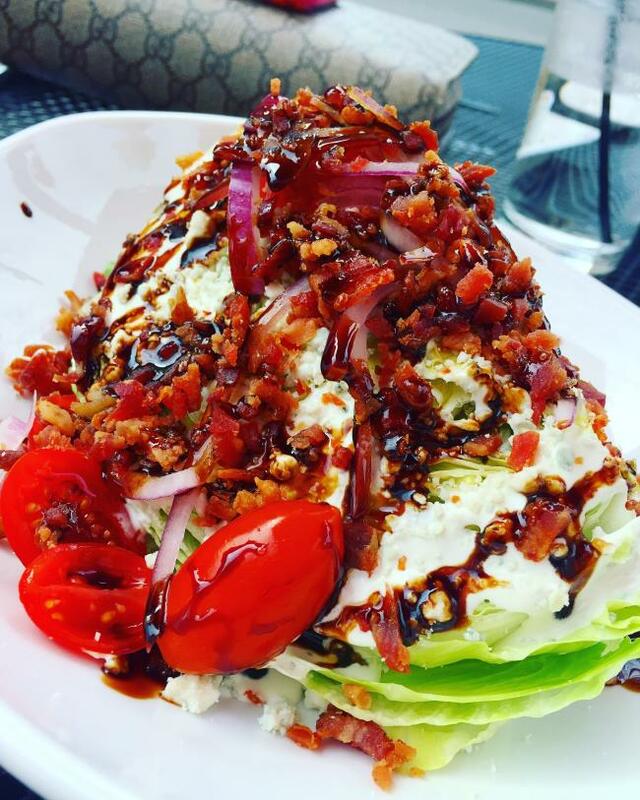 The Woodfire Wedge (pictured above) includes iceberg lettuce, diced tomatoes, red onions, bacon, bleu cheese crumbles, house-made bleu cheese dressing, and a balsamic drizzle. Last but certainly not least, I tried the Caprese Salad (this was a separate occasion guys – don’t be judgey). I have never met a Caprese Salad that I didn’t like and this scenario was no different. Between these three salads and the two remaining on the menu that I have yet to try (Woodfire Chopped and Kale), you will definitely find a salad that will make you come back to Woodfire for more. Five Forks Market is a one-of-a-kind restaurant. They describe themselves as “gourmet in a casual setting” and they are absolutely right. Five Forks is my go-to when I am meeting a friend for a quick and casual lunch, but I still want to show them a restaurant that knows how to make scrumptious (oh yeah I threw a new adjective in the mix) meals. Pictured above is the first salad I ever tried at Five Forks (#MEMZ). 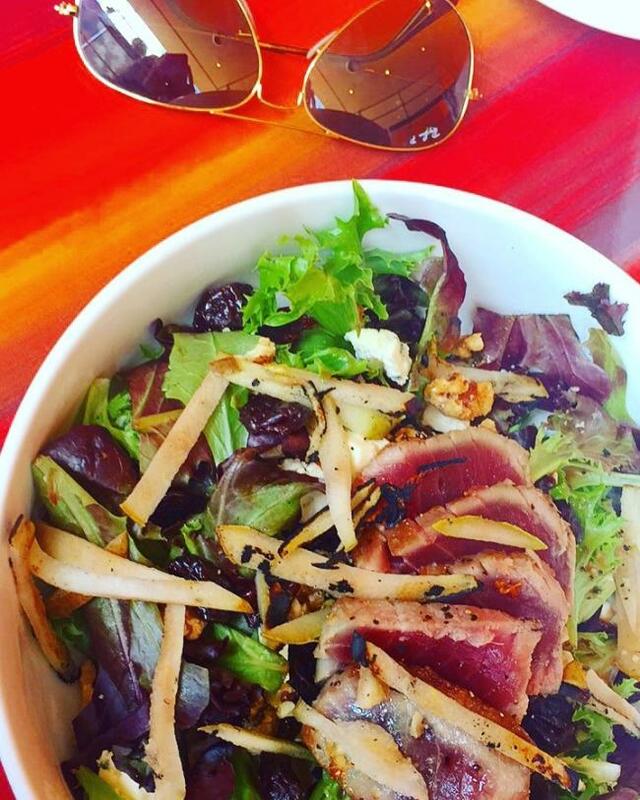 This was called the Caribbean Salad which included mixed greens, Ahi tuna, pineapple, red onion, and so on. 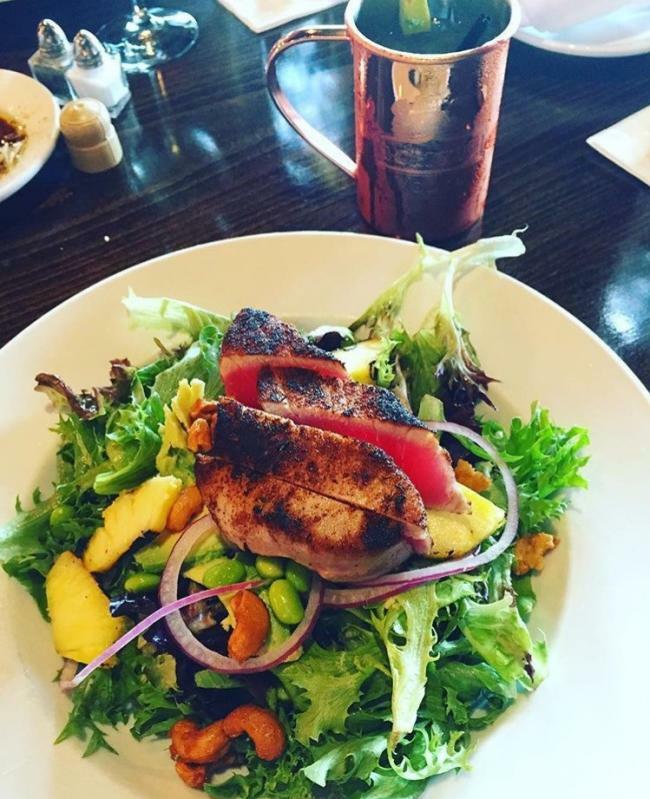 Unfortunately this is no longer on the menu, however the Tuna Salad is very similar which features mixed greens, Ahi tuna, carrots, apples, Marcona almonds, and sweet soy vinaigrette. The cover photo of this blog is another salad that I have had the pleasure of trying at Five Forks. 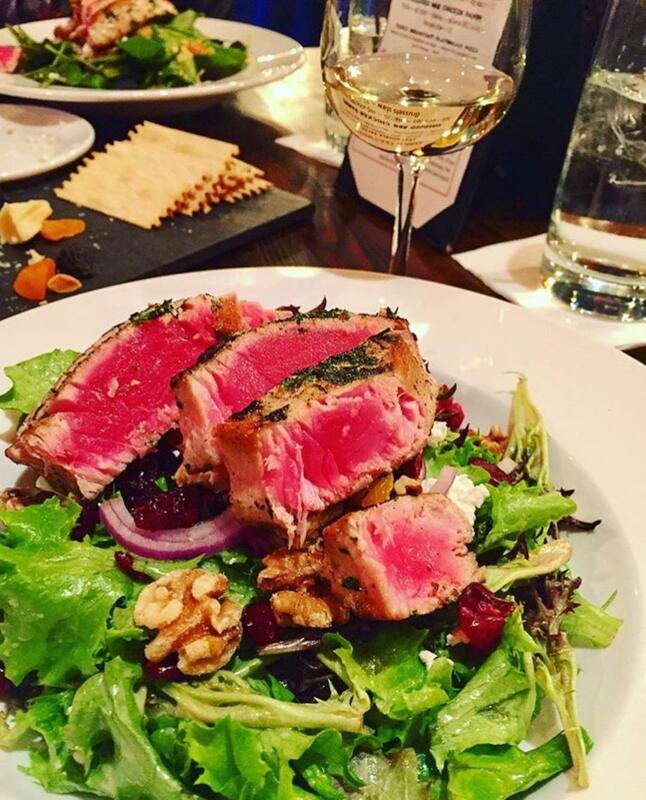 This salad included mixed greens, walnuts, red onion, goat cheese (seriously if you haven’t had goat cheese, you haven’t lived), seared tuna, and more deliciousness. This salad is most comparable to the Five Forks Salad and the Mediterranean Salad. I have tried both of these salads and they are both delightful… so delightful that I didn’t have a chance to take a picture (whoops). I should also mention that I am fully aware of the fact that there is alcohol next to my salads in both photos. I am eating the salad so I can drink the Moscow Mule… It’s all about balance, right? Octane Interlounge is one of my favorite restaurants in the downtown area. Why, you ask? You all know I’m going to tell even if you didn’t ask… SO Octane is one of my favorites because they like to keep me on my toes. Whenever I take a stroll down the street to pay them a visit, my mind is blown. Half of the time I don’t even understand what the ingredients are, but the combination of flavors and textures are SO GOOD every single time. If you told me that I was going to like grilled pears on my salad, I would probably laugh at you and walk away (but then I’d come back and say sorry because I would feel bad). ANYWAYS...the salad pictured above is called the Mocambo Salad which features your choice of fresh pairs, gala apples or grilled pears, dried cherries, gorgonzola, candied walnuts, as well as your choice or raspberry or honey balsamic vinaigrette (Ray Bans are sold separately – wink, wink). I personally like adding a protein to my salads to give them an even greater boost of flavor. In this case, I added tuna but they also offer chicken, portobello, steak, salmon, AND shrimp. Aside from the fact that I love saying Mocambo Salad, I appreciate the fact that Octane gives you so many different options when it comes to the fruit, protein, and dressing on this salad. If this salad doesn’t tickle your fancy, there are plenty of other salad options as well as tasty entrées on their menu. Basically if you haven’t grabbed your car keys and put your coat on yet, you are missing out BIG TIME.